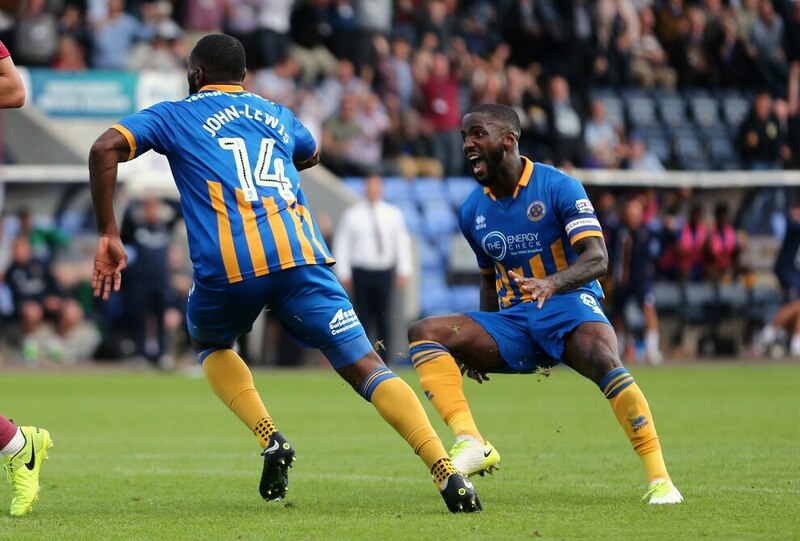 Shrewsbury Town left it late but debutant Lenell John-Lewis struck a dramatic added time winner against Northampton. The travelling Cobblers would’ve been delighted to leave with a point as the hosts were much brighter and well deserved of their winner deep into the three minutes of added time, writes Lewis Cox at Montgomery Waters Meadow. 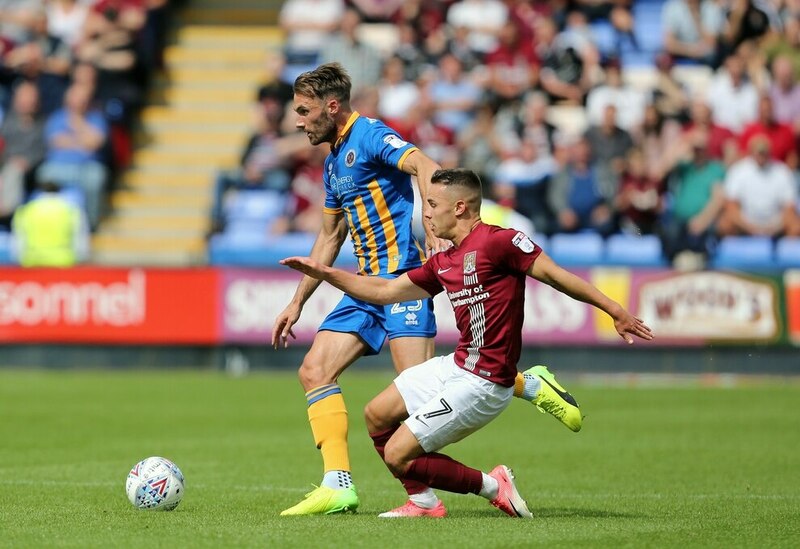 Shrewsbury were silky, neat, easy on the eye and positive with the ball. The supporters were enjoying what they saw - and John-Lewis, signed from Newport and coming from the bench, scuffed in a shot from Alex Rodman’s cross. A stunning way to finish the first 90 minutes of the season, as Town's new hitman, nicknamed 'The Shop', made himself an instant favourite. 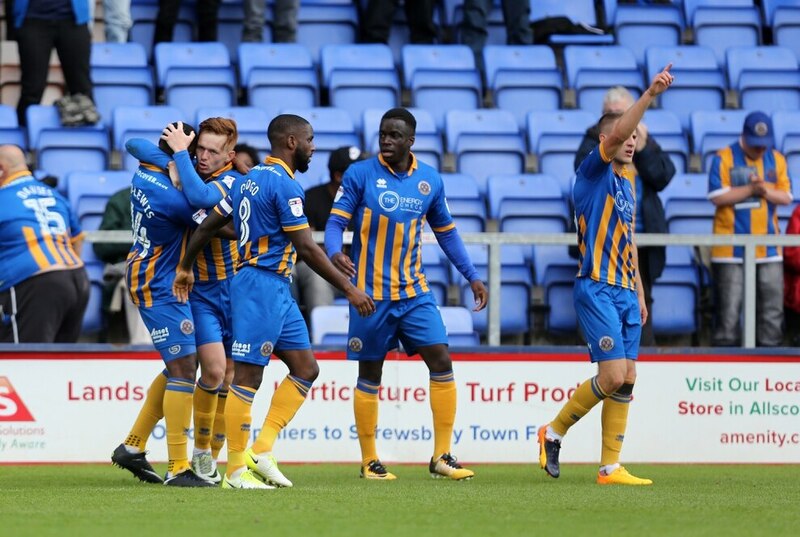 Shrewsbury will hope it's the start of things to come. Ironically it wasn’t Town’s brightest attack of the game, with some delightful approach play throughout encouraging the home faithful. A hearty contingent of Cobblers supporters made the trip north, while anticipation build ahead of kick-off from hopefully home supporters who hope not to be put through the mill of a third straight relegation scrap. 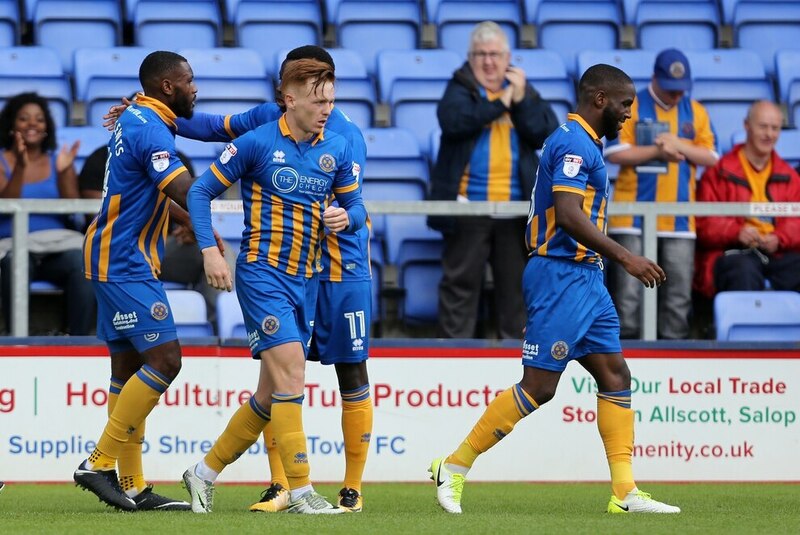 Four of Shrewsbury’s 11 summer signings made Hurst’s first line-up of the season. Dean Henderson took the No.1 shirt, with James Bolton starting at right-back, Jon Nolan in central midfield and Carlton Morris up front. Six more were on the bench, alongside Louis Dodds, who many thought may get the nod from the off. The one absentee from Hurst’s summer shopping was Swansea loanee Dan James, who was seen having a fitness test prior to kick-off. Justin Edinburgh, in the same position as Hurst in assembling his own squad in his first summer in the role, has made 12 new signings - with seven in the starting XI. Town’s woeful recent record of no opening day victory since 2010 would surely be playing on supporters’ mind. Hurst’s record of just one in five with Grimsby Town. The hosts enjoyed much the stronger first 10 minutes. Hurst’s side were on the front foot, winning second balls, with C Morris in attacking really putting himself about. 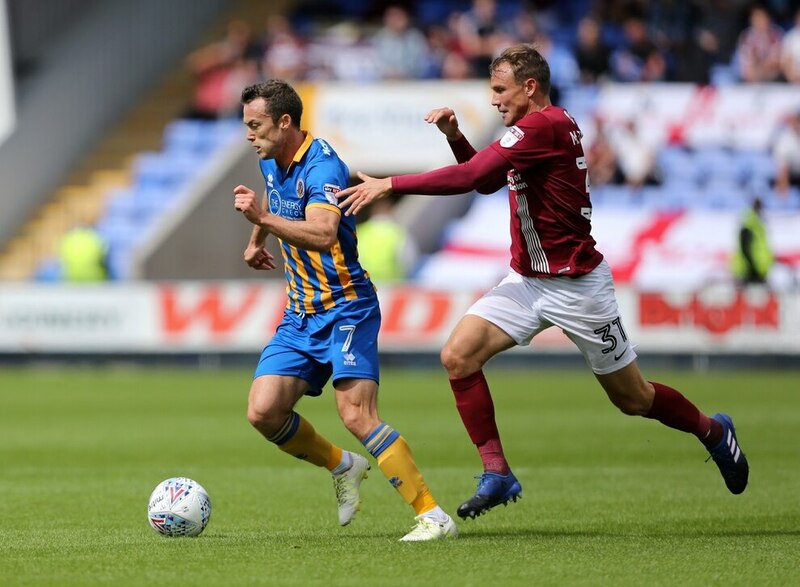 While Shrewsbury enjoyed the opening exchanges, popping the ball around down the left with Alex Rodman involved particularly, the visitors forged the game’s first real chance. Matt Crooks squirmed a ball towards Dean Bowditch, the new Cobblers signing profited on hesitancy from Henderson in goal, rounding the on-loan Manchester United goalkeeper and getting a shot away that Toto Nsiala was able to clear from the line. Despite the scare, Town continued to look the organised and sharp, a number of dangerous corners and free-kicks from Shaun Whalley eventually led to Toto Nsiala glancing one wide. Sizeable Town continued to look threatening from set-pieces in what could be a deliberate ploy from Hurst this term. While Northampton were not entirely convincing in defence, at times dallying with clearances. 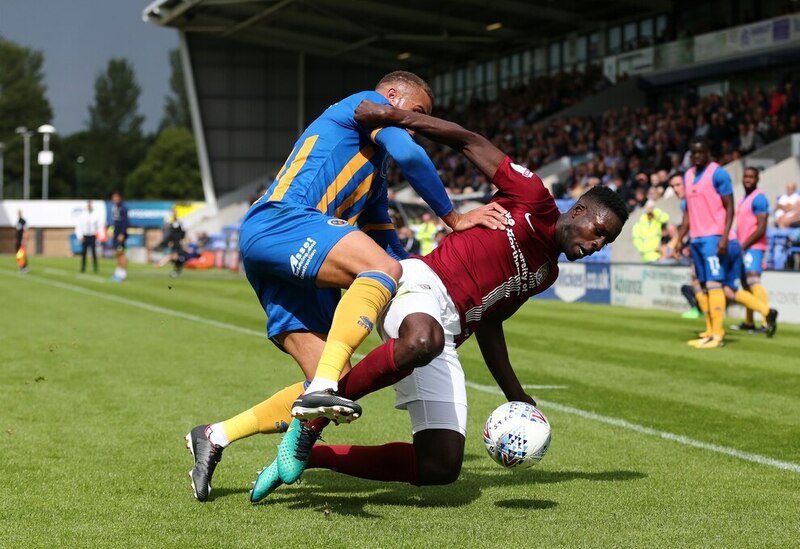 A fierce handball penalty claim near the end of the opening half was the closest we had to goalbound action but Hurst and Shrews could be fairly pleased with an encouraging first of the season. Town gave the best example yet of their new free-flowing football. Nolan dragged his foot over the ball before dinking a pass to Rodman. The winger cushioned it out the air and over the defender beautifully with a sumptuous flick. C Morris was released near the byline, crossing well for Whalley, but the winger deflected effort dribbled wide. An even stronger Town penalty appeal came midway through the second-half and Sebastian Stocksbridge won’t find himself high on Christmas card lists in Shropshire. Rodman’s pull back was perfect for skipper Abu Ogogo, who reached the ball first inside the box and was caught by Aaron Pierre - the Meadow expected a penalty, but Ogogo was pulled up for simulation and booked - much to the disgust of assistant Chris Doig. Hurst waited until 12 minutes from time before shuffling his pack, sending on Lenell John-Lewis and Arthur Gnahoua, the latter impressing immediately. His through ball for Rodman just had too much on it, but the visitors were causing problems. A Yaser Kasim corner first warranted a handball shout, before Bowditch and Leon Barnett both had a flurry of efforts blocked. A 30 second period where Town fans were chewing their nails. It opened up a little inside the final 10 minutes but the hosts would deservedly have the final say. Nolan, who looked class, started it, spraying the ball to Rodman. The winger’s low cross was somehow met by John-Lewis, who held off his defender and sent an effort beyond Cornell to euphoric scenes at the Meadow. 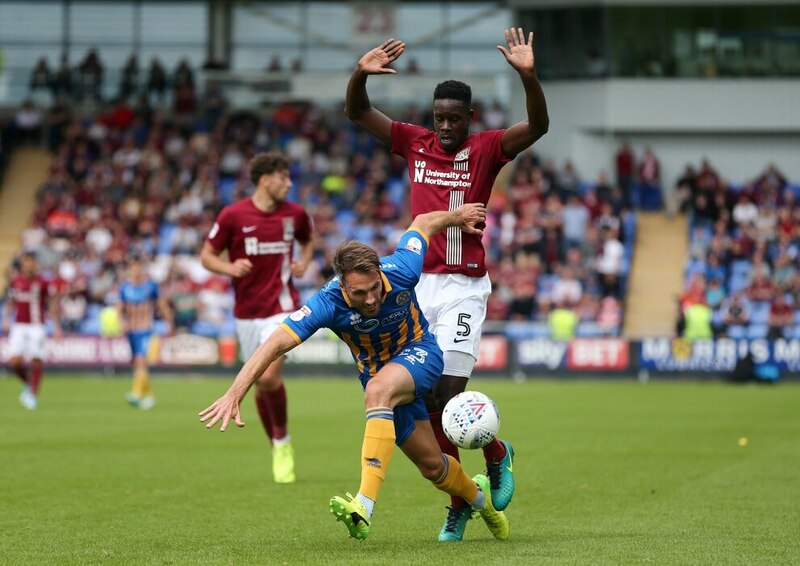 There was somehow still time for a Cobblers set piece, but Town bravely held on to start Hurst’s proper Shrewsbury era with a deserved points haul. 17 - Off the line from Toto Nsiala after Dean Bowditch had rounded Dean Henderson - well positioned from the defender. 25 - Nsiala not far from making an impact at the other end, glancing Shaun Whalley’s corner wide. 39 - Alex Rodman this time ignored Junior Brown’s overlap, cutting inside to drag wide of the near post from distance. 42 - Town fans screaming for a spot-kick after Jon Nolan’s nice touch feeds Whalley whose goal-bound shot is blocked. Nothing doing. 52 - Best move of the game. Nolan to Rodman, C Morris is sent through out wide, his cross is met by Whalley but it dribbles wide. C Morris then has a wild swing from the corner. 68 - Rodman’s low cross finds Abu Ogogo just inside the box, the Town skipper gets there first, touches beyond Aaron Pierre and is caught, then booked for simulation. 75 - Sub Alex Revell heads fellow sub Yaser Kasim’s cross at Henderson. 81 - A flurry of Northampton efforts and penalty shouts are valiantly blocked by Town. 90+2 - GOAL TOWN - Lenell John-Lewis wins it from Rodman’s cross. Wow!